Deadbolt locks are one way to secure your home or business against intrusion by unwanted persons. Having them properly installed is imperative if safety is to be achieved. Here at Dallas FW Locksmith, we are proud to offer you the very best service available in deadbolt lock installation and repair. We provide our residential and commercial customers with licensed, bonded, and insured, expert technicians. Our technicians are fully trained in the locksmith trade and are conscientious of our customers’ need for superior service. This allows us to offer the best service for deadbolt locks in the Dallas-Fort Worth, TX area. With 5+ years of experience, we are well known for our excellent handling of customers’ needs. We not only install and service deadbolt locks but also offer a complete locksmith service. If you are in Dallas and Fort Worth, TX and surrounding areas and need A+ service, call us anytime, 24/7 to receive fast and friendly assistance from our staff. We have a 24x7 locksmith service available. This means that we are able to be on the job at any hour of the day or night. In addition, our mobile locksmiths have a 30 min response time, which allows us to take care of any emergency at any hour. All of our mobile locksmiths are prompt, courteous, and understand the frustration of not being able to open your door or having other lock problems. In addition to commercial and residential lock problems, we also service any automotive lock problems that might occur. Our purpose is to be able to take care of our customers’ needs with our complete locksmith service as quickly as possible, and provide up front pricing. This allows you to receive the very best assistance available at excellent prices by expert technicians who are dedicated to providing fast and friendly service. Our work and products are fully guaranteed so you can rest assured that you are receiving only quality parts as well as personal attention to your needs. Deadbolt locks require special training and expertise in order to be properly installed. There are a number of different types and brands available in single, double cylinder, and vertical styles. A single cylinder deadbolt has one side to accept a key but requires a twist knob on the other side. A double cylinder accepts a key on both sides and does not require a twist knob. There are also exit only and push-button deadbolts. The latter can can be electrical or manual. Nevertheless, all of these are equipped with excellent safety features for any exterior door, residential or commercial. While there are a variety of locks on the market, deadbolt locks have proved themselves by providing an excellent security measure with both residential and business locations. This is what makes them a preferred type of lock with many of our customers. There are a number of brands and styles to choose from so it is possible for us to match any door beautifully. Both commercial and residential applications that require deadbolt locks will provide the utmost protection for our customers. We strive to meet this requirement by consulting with you to determine your security needs. We will examine the door for width and other requirements and provide you with all of the information regarding what is required for maximum security. At that time, you will also receive an estimate for the installation. Repairing a deadbolt is also one of our specialties and likewise, we will provide you with upfront pricing for the work involved. At Dallas FW Locksmith, we are dedicated to taking care of both residential and commercial customers with the best support available. We offer complete, 24x7 locksmith service as well as up front pricing for our Dallas and Fort Worth, TX customers. This provides you with immediate service for your needs at a price you can afford. When servicing these areas, we offer a complete install and repair locksmith service that can remedy any type of deadbolt lock issues you may have. When you want the very best, it is important to choose a first class company that is well known for its dedication to customers’ needs. We are proud to fill that requirement. 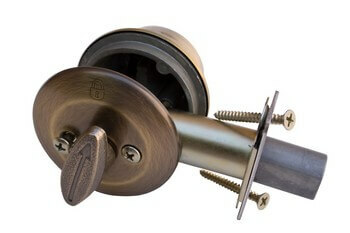 Deadbolt Locks http://dallasfwlocksmith.com/deadbolt-locks/ 3.5/5 based upon 20 reviews.